Rather restore the old foundation of Alexander Bicknor, archbishop of Dublin in 1320, which had been entirely lost. 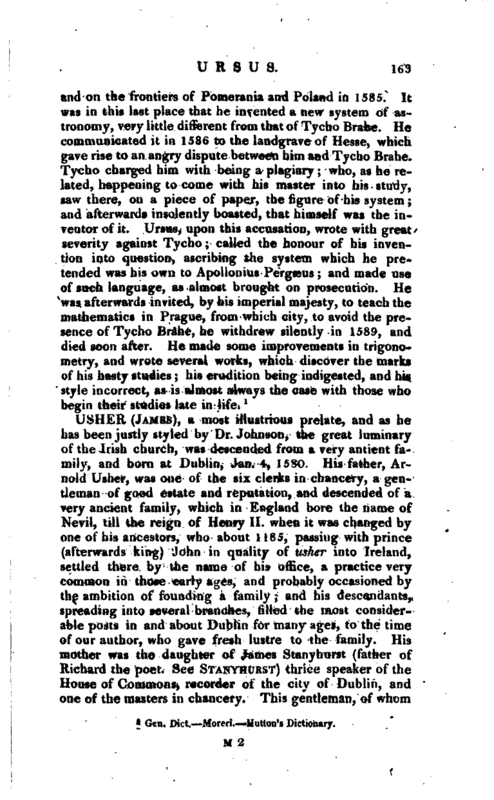 Henry Usher was a native of Dublin, and received part of his education at Cambridge. Wood says that in 1572 he removed to University college, Oxford: and in July of that year was incorporated B. A. which degree he had taken at Cambridge. He adds that he here “laid in a sure foundation in divinity, by the aid of Dr. Humphrey, Dr. Holland, and others.” His first promotion was to the treasurership of Christ-church, and in 1580 he was admitted into the chapterhouse, and installed archdeacon of Dublin. 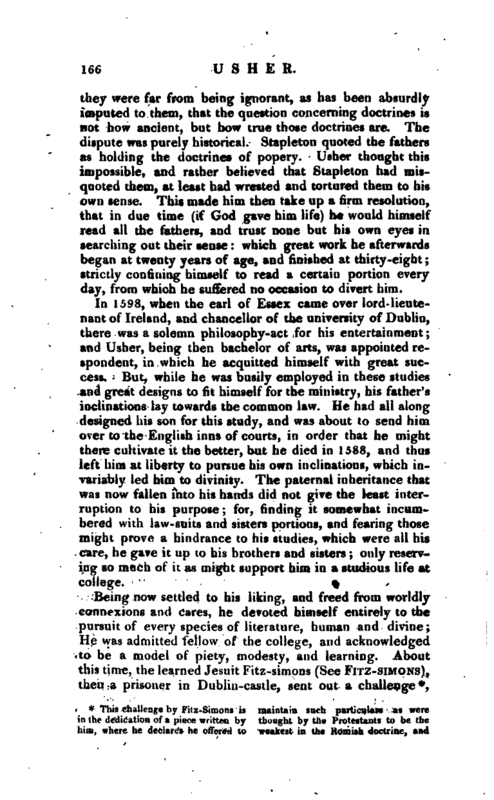 In reward of the pains he took in re-founding the university of Dublin, he was made the first fellow of it. From the archdeaconry of Dublin he was advanced to the see of Armagh in 1595. He had before that been employed by the dean and chapter of St. Patrick’s, to prevent the suppression of that church, when attempted by the lord deputy Perrot and by his prudence, wisdom, and vigilance, was successful. He died, an old man, April 2, 1613, and was buried at Drogheda in St. Peter’s church. Eleven years afterwards he was succeeded in the primacy by his celebrated nephew. archbishop of Armagh, who was James Usher’s uncle. 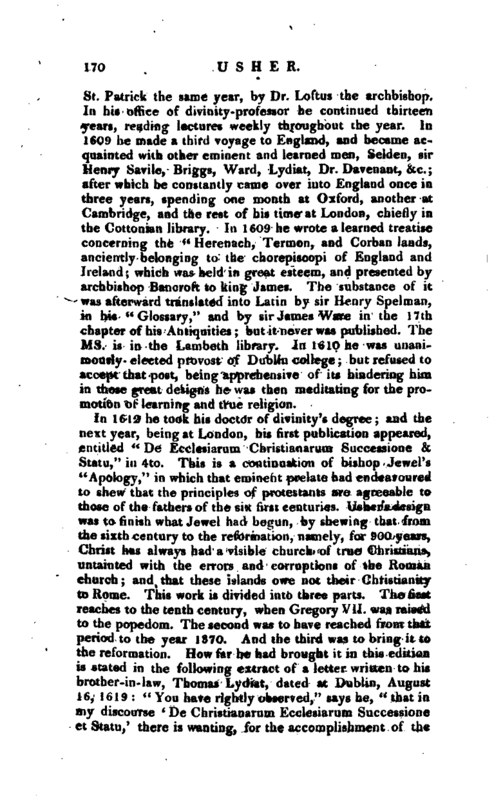 James discovered great parts and a strong passion for books from his infancy; and this remarkable circumstance attended the beginning of his literary pursuits, that he was taught to read by two aunts, who had been blind from their cradle, but had amazing memories, and could repeat most part of the Bible with readiness and accuracy; C<ecorum mens oculatissima. At eight years of age he was sent to a school, which was opened by Mr. James Fullerton and Mr. James Hamilton, two young Scots gentlemen, who were placed at Dublin by king James I. then only king of Scotland, to keep a correspondence with the protestant nobility and gentry there, in order to secure an interest in that kingdom, in the event of queen Elizabeth’s death: but her majesty being very sore upon this point, and unwilling to think of a successor, this was a service of some danger, and therefore it was thought expedient for them to assume the disguise of school-masters, a class of men which was very much wanted in Ireland at that time. Mr. Fullerton was afterwards knighted, and of the bed-chamber to king James; and Mr. Hamilton was created viscount Clandebois. 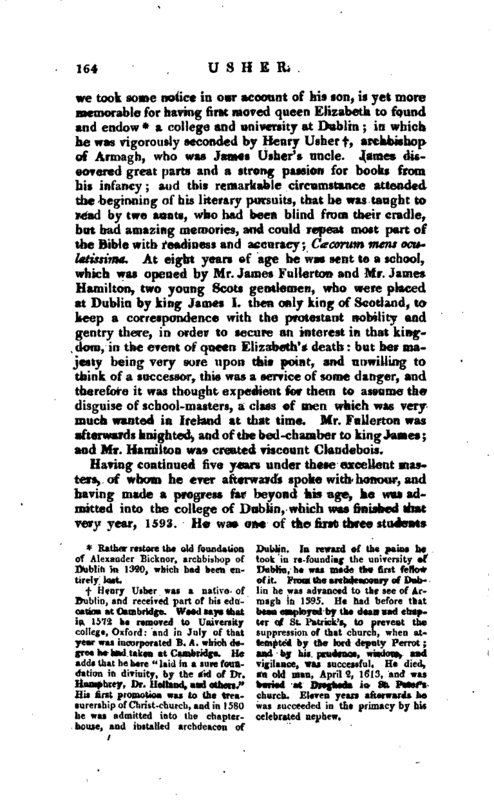 Having continued five years under these excellent masters, of whom he ever afterwards spoke with honour, and having made a progress far beyond his age, he was admitted into the college of Dublin, which was finished that very year, 1593. He was one of the first three students | who were admitted; and his name stands to this day in the first line of the roll. Dr. Bernard seems to hint that he was the first graduate, fellow, and proctor, which we doubt, at least as to the fellowship, his uncle being first fellow, and his tutor at this time senior fellow, according to Harris. Here he learned logic, and the philosophy of Aristotle, under Mr. Hamilton, his tutor, and though, as we are told, his love of poetry and cards retarded his studies for some time, yet he soon recovered himself from these habits, applied to books again with great vigour, and at the same time acquired that pious turn which was ever afterwards a distinguishing; feature in his character. He is said to hare been wonderfully affected with that passage in Cicero, “Nescire quid antea quam natus sis accident, id est semper esse puerum” that is, “to know nothing of what happened before you were born is to be always a boy.” About this time, from meeting with Sleidan’s little book “De quatuor imperiis,” he contracted an extreme fondness for the study of history, which he afterwards pursued with equal depth and preciseness. 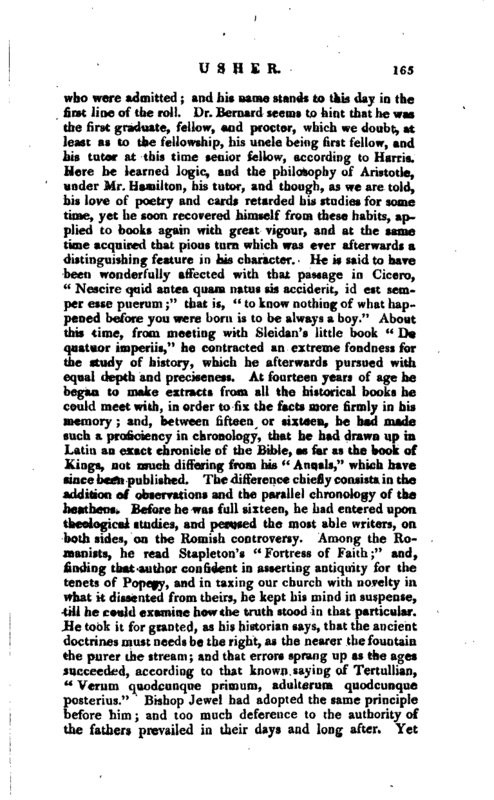 At fourteen years of age he began to make extracts from all the historical books he could meet with, in order to fix the facts more firmly in his memory; and, between fifteen or sixteen, he had made such a proficiency in chronology, that he had drawn up in Latin an exact chronicle of the Bible, as far as the book of Kings, not much differing from his “Annals,” which have since been published. The difference chiefly consists in the addition of observations and the parallel chronofcugy of the heathens. Before he was full sixteen, he had entered upon theological studies, and perused the most able writers, on both sides, on the Romish controversy. Among the Romanists, he read Stapleton’s “Fortress of Faith;” and, finding that author confident in asserting antiquity for the tenets of Popery, and in taxing our church with novelty in. what it dissented from theirs, he kept his mind in suspense, till he could examine how the truth stood in that particular. He took it for granted, as his historian says, that the ancient doctrines must needs be the right, as the nearer the fountain the purer the stream; and that errors sprang up as the ages succeeded, according to that known saying of Tertullian, “Verum quodcunque primum, adulterum quodcunque posterius.” Bishop Jewel had adopted the same principle before him; and too much deference to the authority of the fathers prevailed in their days and long after. Yet | they were far from being ignorant, as has been absurdly imputed to them, that the question concerning doctrines is not how ancient, but how true those doctrines are. The dispute was purely historical. Stapleton quoted the fathers as holding the doctrines of popery. Usher thought this impossible, and rather believed that Stapleton had misquoted them, at least had wrested and tortured them to his own sense. This made him then take up a firm resolution, that in due time (if God gave him life) he would himself read all the fathers, and trust none but his own eyes in searching out their sense: which great work he afterwards began at twenty years of age, and finished at thirty-eight; strictly confining himself to read a certain portion every day, from which he suffered no occasion to divert him. 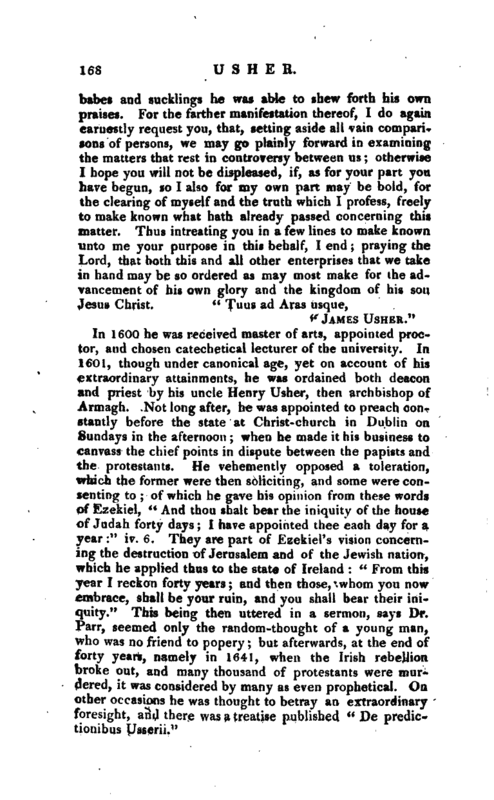 In 1398, when the earl of Essex came over lord- lieutenant of Ireland, and chancellor of the university of Dublin, there was a solemn philosophy-act for his entertainment; and Usher, being then bachelor of arts, was appointed respondent, in which he acquitted himself with great success. But, while he was busily employed in these studies and great designs to fit himself for the ministry, his father’s inclinations lay towards the common law. He had all along designed his son for this study, and was about to send him over to the English inns of courts, in order that he might there cultivate it the better, but he died in 1588, and thus left him at liberty to pursue his own inclinations, which invariably led him to divinity. The paternal inheritance that was now fallen into his hands did not give the least interruption to his purpose; for, finding it somewhat incumbered with law-suits and sisters portions, and fearing those might prove a hindrance to his studies, which were all his care, he gave it up to his brothers and sisters; only reserving so much of it as might support him in a studious life at college. to attack all those points which they thought to be the strongest in their doctrine. “But nobody would hear me, (says he) though I called with a voice as loud as Stentor to the contest, Only there once came to me a youth of about eighteen, very forward in his understanding, who shewed a very strong desire of disputing upon the most abstruse points of divinity, though he had not completed his course of philosophy, nor arrived to manhood. But when I asked him if he had leave from his superiors, promising in that case to enter the lists with him, the young man, not being honoured with any such commission, had nothing to shew, and returned no more.” The fallacy of this representation appears by the account in the text. In 1600 he was received master of arts, appointed proctor, and chosen catechetical lecturer of the university. In 1601, though under canonical age, yet on account of his extraordinary attainments, he was ordained both deacon and priest by his uncle Henry Usher, then archbishop of Armagh. Not long after, he was appointed to preach constantly before the state at Christ-church in Dublin on Sundays in the afternoon; when he made it his business to canvass the chief points in dispute between the papists and the protestants. He vehemently opposed a toleration, which the former were then soliciting, and some were consenting to; of which he gave his opinion from these words of Ezekiel, “And thou shalt bear the iniquity of the house of Judah forty days; I have appointed thee each day for a year:” iv. 6. They are part of Ezekiel’s vision concerning the destruction of Jerusalem and of the Jewish nation, which he applied thus to the state of Ireland “From this year I reckon forty years and then those, whom you now embrace, shall be your ruin, and you shall bear their iniquity.” This being then uttered in a sermon, says Dr. Parr, seemed only the random-thought of a young man, who was no friend to popery; but afterwards, at the end of forty years, namely in 1641, when the Irish rebellion broke out, and many thousand of protestants were murdered, it was considered by many as even prophetical. On other occasions he was thought to betray an extraordinary foresight, and there was a treatise published “De predictionibus Usserii.” | In 1603 he was sent over to England with Dr. Luke Challoner, in order to purchase books for the library at Dublin; the English army, who defeated the Spaniards at Kinsale, having contributed the sum of 1800l. for this purpose. 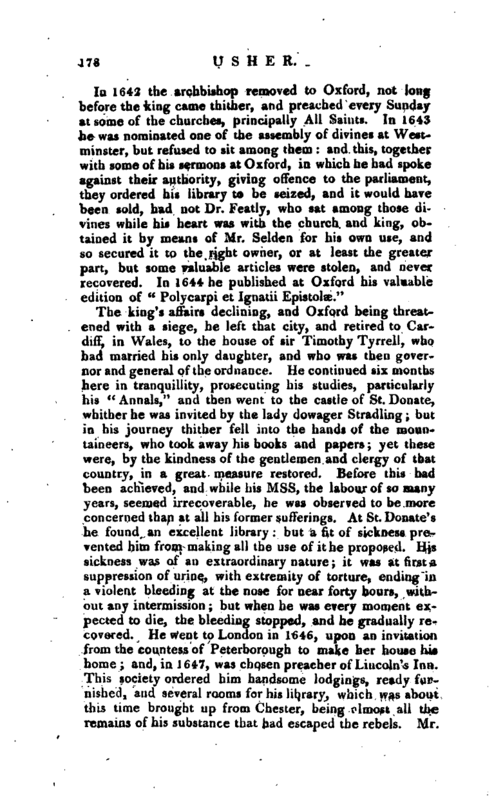 On his arrival he found sir Thomas Bodley at London, employed in the same manner for his newlyerected library at Oxford, and they are said to have mutually assisted each other. It was during his absence upon this occasion that his mother was reconciled to the Romish religion, which gave him the most afflicting concern, and the more as she continued obstinate to the last, dying at Drogheda in the communion of that church. It appears also, that her father, the recorder, though outwardly a conformist to the new religion, after its establishment by Q. Elizabeth, yet still retained his old affection for popery, as appears from his supporting first in his own house Edmund Campian, afterwards the famous Jesuit, then a refugee from England, and in the next place recommending him to a friend in the country, where he might be secure from the danger of being seized and brought to justice for treasonable practices, in drawing her majesty’s subjects from their allegiance. The recorder took care however to conduct himself so prudently, as to give no umbrage to the government, and by that means continued unmolested in his post. 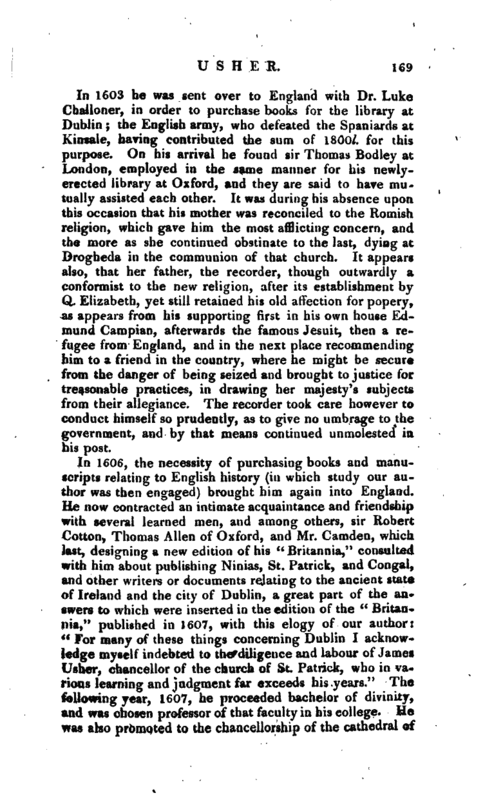 of Ireland and the city of Dublin, a great part of the answers to which were inserted in the edition of the “Britannia,” published in 1607, with this elogy of our author: “For many of these things concerning Dublin I acknowledge myself indebted to the diligence and labour of James Usher, chancellor of the church of St. Patrick, who in various learning and judgment far exceeds his years.” The following year, 1607, he proceeded bachelor of divinity, and was chosen professor of that faculty in his college. He was also promoted to the chancellorship of the cathedral of | St. Patrick the same year, by Dr. Loftus the archbishop. In his office of divinity-professor he continued thirteen years, reading lectures weekly throughout the year. In 1609 he made a third voyage to England, and became acquainted with other eminent and learned men, Selden, sir Henry Savile, Briggs, Ward, Lydiat, Dr. Davenant, &c. after which he constantly came over into England once in three years, spending one month at Oxford, another at Cambridge, and the rest of his time at London, chiefly in the Cottonian library. In 1609 he wrote a learned treatise concerning the “Herenach, Termon, and Corban lands, anciently belonging to the chorepiscopi of England and Ireland; which was held in great esteem, and presented by archbishop Bancroft to king James. 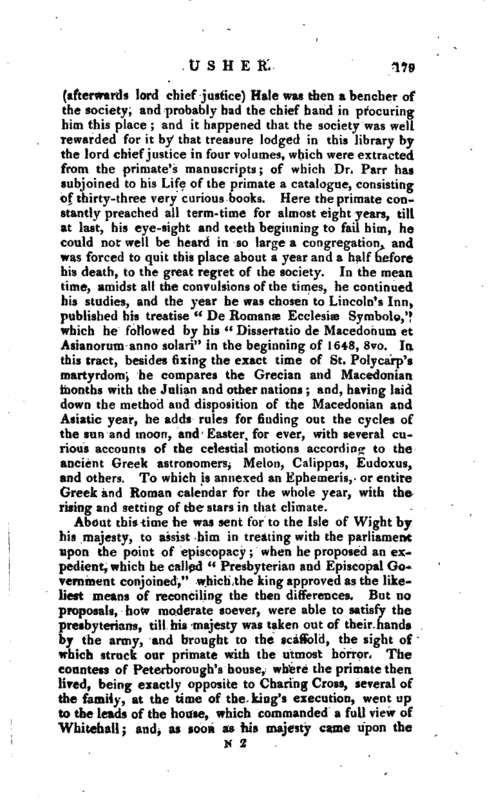 The substance of it was afterward translated into Latin by sir Henry Spelman, in his” Glossary," and by sir James Ware in the 17th chapter of his Antiquities; but it never was published. The ms. is in the Lambeth library. In 1610 he was unanimously elected provost of Dublin college; but refused to accept that post, being apprehensive of its hindering him in those great designs he was then meditating for the promotion of learning and true religion. In 1612 he took his doctor of divinity’s degree; and the next year, being at London, his first publication appeared, entitled “De Ecclesiarum Christianarum Successione & Statu,” in 4to. This is a continuation of bishop Jewel’s “Apology,” in which that eminent prelate had endeavoured to shew that the principles of protestants are agreeable to those of the fathers of the six first centuries. Usher’s design was to finish what Jewel had begun, by shewing that from, the sixth century to the reformation, namely, for 900 years, Christ has always had a visible church of true Christians, untainted with the errors and corruptions of the Roman church; and that these islands owe not their Christianity to Rome. This work is divided into three parts. The first reaches to the tenth century, when Gregory VII. was raised to the popedom. The second was to have reached from that period to the year 1370. And the third was to bring it to the reformation. How far he had brought it in this edition is stated in the followirig extract of a letter written to his brother-in-law, Thomas Lydiat, dated at Dublin, August 16, 1619: “You have rightly observed,” says be, “that in my discourse ‘ De Christianarum Ecclesiarum Successione et Statu,’ there is wanting, for the accomplishment of the | second part, a hundred years [from 1240 to 1370, viz. the last chapter of this part]; which default, in the continuation of the work is by me supplied. I purpose to publish the whole work together, much augmented, but do first expect the publication of my uncle Stanyhurst’s answer to the former, which, I hear, since his death, is sent to Paris, to be there printed. I am advertised, also, that even now there is one at Antwerp who hath printed a treatise of my countryman De sacro Bosco (Holywood), ‘ De ver Ecclesise investigatione,’ wherein he hath some dealing with me. Both these I would willingly see before I set about reprinting my book, meaning, that if they have justly found fault with any thing, I may amend it; if unjustly, I may defend it.” His uncle’s answer, however, was never published, nor did our author publish any other edition of his work, as he here purposed; probably prevented by the distraction of the times. It was reprinted at Hanover in 1658, 8vo, without any amendments. In the last edition of 1687, containing likewise his Antiquity of the British Churches, are these words in the title-page: “Opus integrum ab Auctore auctum et recognitnm;” which, Dr. Smith observes, was a trick of the bookseller. Usher’s work was solemnly presented by archbishop Abbot to king James, as the eminent first fruits of the college of Dublin. The same year, 1612, upon his return to Ireland, he married Phoebe, only daughter of Dr. Luke Challoner, who died this year April the 12th, and in his last will recommended our author to his daughter for a husband, if she was inclined to marry. In 1615 there was a parliament held at Dublin, and a convocation of the clergy, in which were composed certain articles relating to the doctrine and discipline of the church. These articles were drawn up by Usher, and signed by archbishop Jones, then lord chancellor of Ireland, and speaker of the house of bishops in convocation, by order from James I, in his majesty’s name. Among these articles, which amount to the number of one hundred and four, besides asserting the doctrine of predestination and reprobation in the strongest terms, one of them professes that there is but one catholic church, out of which there is no salvation; and another maintains thut the sabbath-day ought to be kept holy. 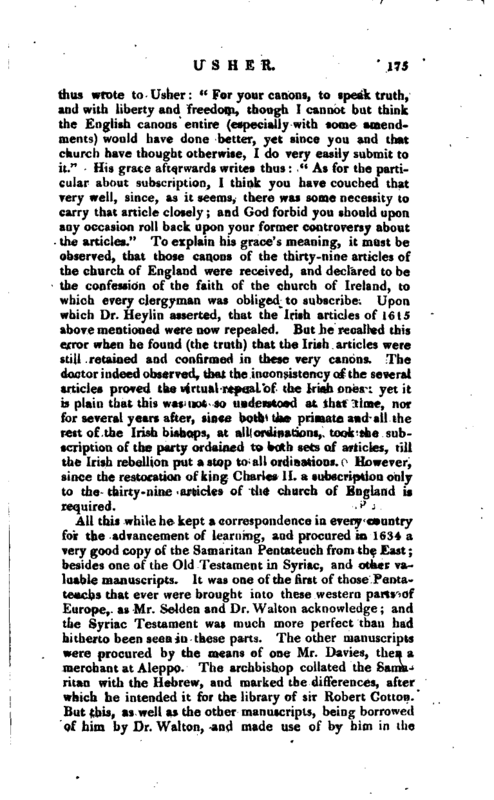 Upon these accounts Dr. Heylin called the passing of these articles an absolute plot of the Sabbatarians and Calvinists in England to make themselves so strong a party in Ireland as to obtain what | they pleased in this convocation. Our author was well known to be a strong asserter of the predestinarian principles; and being besides of opinion that episcopacy was not a distinct order, but only a different degree from that of presbyters, he certainly cannot be exculpated from the charge of puritanism. However, as he always warmly asserted the king’s supremacy, and the episcopal form of church government established, and all the discipline of it, it has been said that all the objections to him, as inclined to puritanism, were the effect of party, the church beginning about this time to be divided between the Calvinistic and Arminiau principles upon the quinquarticular controversy. 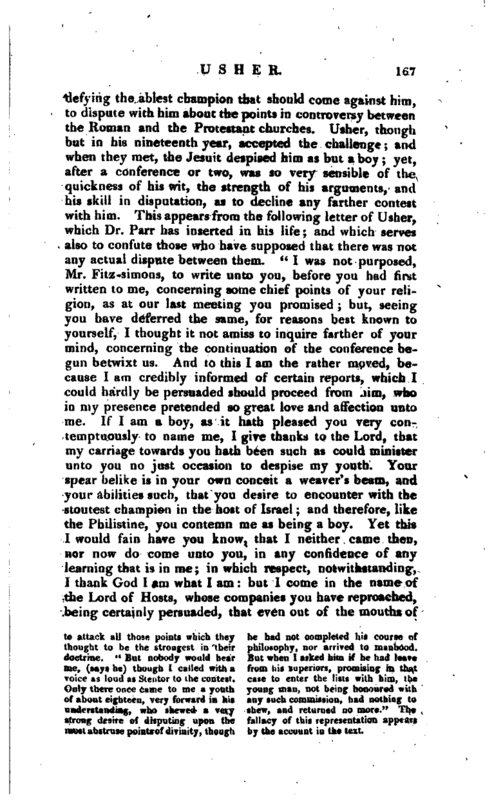 Dr. Parr tells us, his enemies were of no great repute for learning and worth; and that our author, hearing of their attempts to deprive him of his majesty’s favour, procured a letter from the lord deputy and council of Ireland to the privy council in England, in defence of his principles, which he brought over to England in 1619, and satisfied his majesty so well upon that point, that in 1620 he promoted him to the bishopric of Meath. In November 1622 he made a speech in the castle-chamber at Dublin upon the censuring of certain officers, concerning the lawfulness of taking, and the danger of refusing, the oath of supremacy; which pleased king James so well that he wrote him a letter of thanks for it. 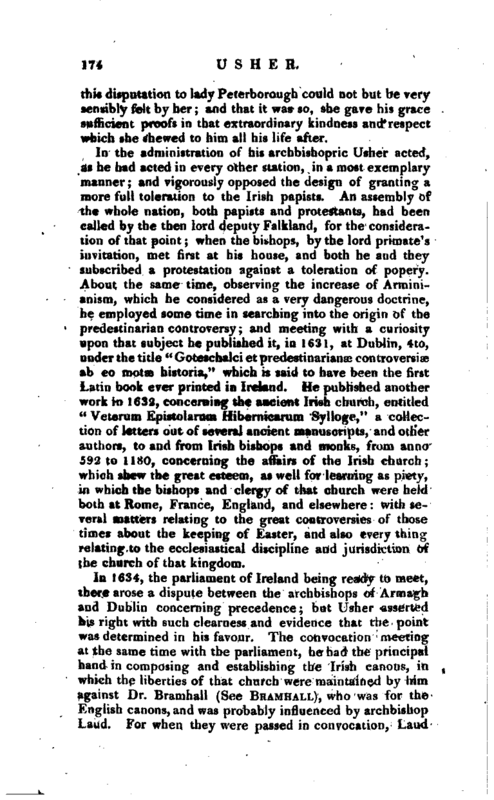 In 1623 he was constituted a privy counsellor of Ireland, and made another voyage to England, in order to collect materials for a work concerning the antiquities of the churches of England, Scotland, and Ireland, which the king himself had employed him to write and soon afterhis return to Ireland was engaged in answering the challenge of Malone, an Irish Jesuit of the college of Louvain. 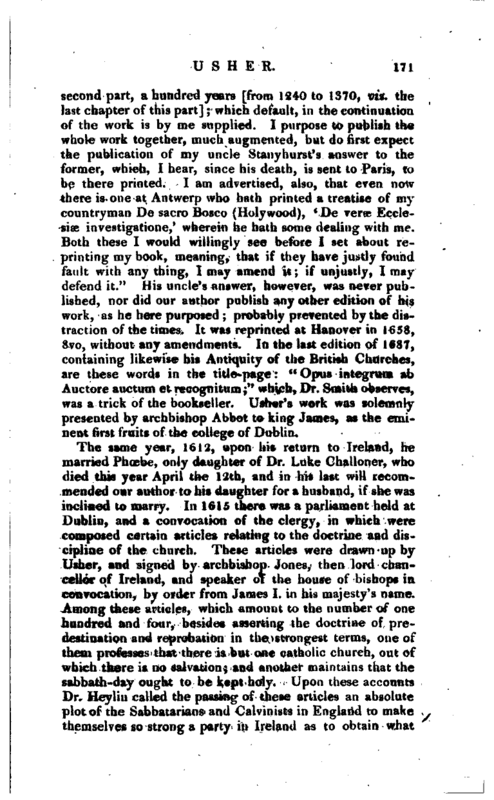 He was again in England, when king James, just before he died, advanced him to the archbishopric of Armagh; but, as he was preparing to return to Ireland, he was seized with a quartan ague, which detained him nine months. Before he left England he had a disputation with a popish priest at Drayton in Northamptonshire, the seat of lord Mordaunt, afterwards earl of Peterborough. He was scarce recovered from his ague, when this lord Mordaunt, then a zealous Roman catholic, being very desirous to bring his lady into the pale of that church, cpncluded that there could be no better or more certain way than to procure a disputation to be held between two learned and principal | persons, one of each side, at which his lady should be present. In that resolution he chose, for the champion of his own cause, the Jesuit Beaumont, whose true name was Rookwood, being brother to that Rookwood who was executed for the gunpowder treason. 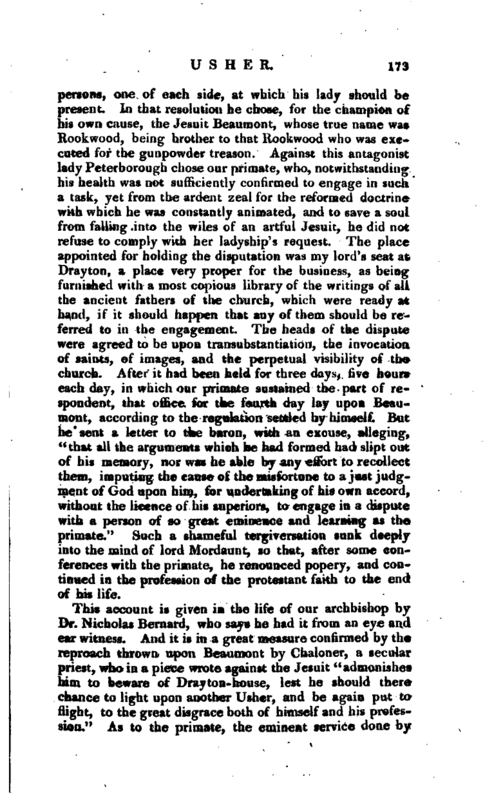 Against this antagonist lady Peterborough chose our primate, who, notwithstanding his health was not sufficiently confirmed to engage in such a task, yet from the ardent zeal for the reformed doctrine with which he was constantly animated, and to save a soul from falling into the wiles of an artful Jesuit, he did not refuse to comply with her ladyship’s request. The place appointed for holding the disputation was my lord’s seat at Drayton, a place very proper for the business, as being furnished with a most copious library of the writings of all the ancient fathers of the church, which were ready at hand, if it should happen that any of them should be re-> ferred to in the engagement. The heads of the dispute were agreed to be upon transubstantiation, the invocation of saints, of images, and the perpetual visibility of the church. After it had been held for three days, five hours each day, in which our primate sustained the part of respondent, that office for the fourth day lay upon Beaumont, according to the regulation settled by himself. But he sent a letter to the baron, with an excuse, alleging, “that all the arguments which he had formed had slipt out of his memory, nor was he able by any effort to recollect them, imputing the cause of the misfortune to a just judgment of God upon him, for undertaking of his own accord, without the licence of his superiors, to engage in a dispute with a person of so great eminence and learning as the primate.” Such a shameful tergiversation sunk deeply into the mind of lord Mordaunt, so that, after some conferences with the primate, he renounced popery, and Cod­tinued in the profession of the protestant faith to the end of his life. This account is given in the life of our archbishop by Dr. Nicholas Bernard, who says he had it from an eye and ear witness. And it is in a great measure confirmed by the reproach thrown upon Beaumont by Chaloner, a secular priest, who in a piece wrote against the Jesuit “admonishes him to beware of Drayton-house, lest he should there chance to light upon another Usher, and be again put to flight, to the great disgrace both of himself and his profession.” As to the primate, the eminent service done by | this disputation to lady Peterborough could not but be very sensibly felt by her; and that it was so, she gave his grace sufficient proofs in that extraordinary kindness and respect which she shewed to him all his life after. In the administration of his archbishopric Usher acted, as he had acted in every other station, in a most exemplary manner; and vigorously opposed the design of granting a more full toleration to the Irish papists. An assembly of the whole nation, both papists and protestants, had been called by the then lord deputy Falkland, for the consideration of that point; when the bishops, by the lord primate’s invitation, met first at his house, and both he and they subscribed a protestation against a toleration of popery. About the same time, observing the increase of Arminianism, which he considered as a very dangerous doctrine, he employed some time in searching into the origin of the predestinarian controversy; and meeting with a curiosity upon that subject he published it, in 1631, at Dublin, 4to, under the title “Goteschalci et predestinarianse controversial ab eo motae historia,” which is said to have been the first Latin book ever printed in Ireland. He published another work in 1632, concerning the ancient Irish church, entitled “Veterum Epistolarum Hibernicarum Sylloge,” a collection of letters out of several ancient manuscripts, and other authors, to and from. Irish bishops and monks, from anno 592 to 1180, concerning the affairs of the Irish church; which shew the great esteem, as well for learning as piety, in which the bishops and clergy of that church were held both at Rome, France, England, and elsewhere: with several matters relating to the great controversies of those times about the keeping of Easter, and also every thing relating to the ecclesiastical discipline aod jurisdiction of the church of that kingdom. 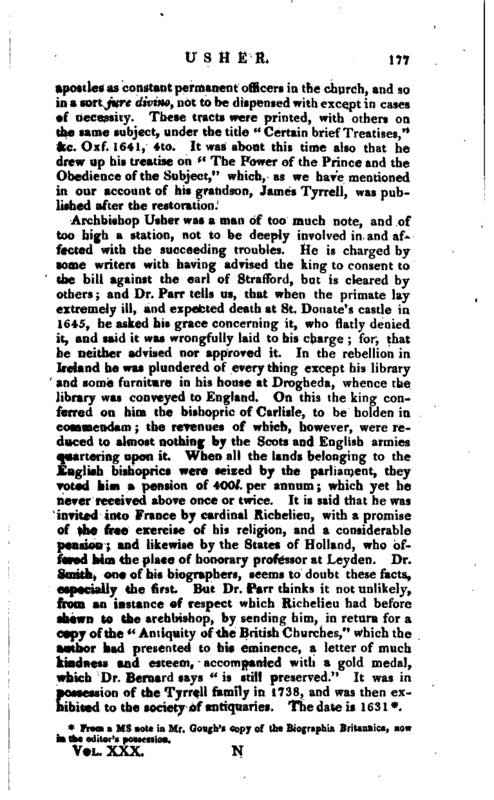 In 1634, the parliament of Ireland being ready to meet, there arose a dispute between the archbishops of Armagh and Dublin concerning precedence; but Usher asserted his right with such clearness and evidence that the point was determined in his favour. 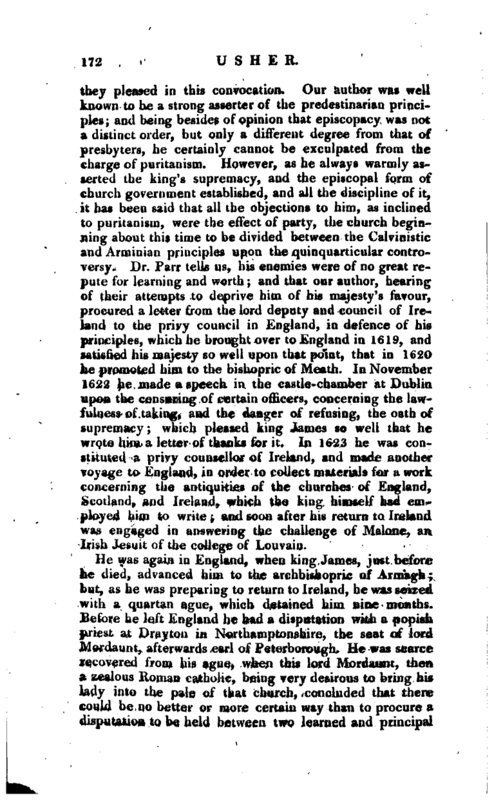 The convocation meeting at the same time with the parliament, he bad the principal hand in composing and establishing the Irish canons, in which the liberties of that church were maintained by him against Dr. Bramhall (See Bramhall), who was for the English canons, and was probably influenced by archbishop Laud. For when they were passed in convocation, Laud | thus wrote to Usher: “For your canons, to speak truth, and with liberty and freedom, though I cannot but think the English canons entire (especially with some amendments) would have done better, yet since you and that church have thought otherwise, I do very easily submit to it.” His grace afterwards writes thus: “As for the particular about subscription, I think you have couched that very well, since, as it seems, there was some necessity to carry that article closely; and God forbid you should upon any occasion roll back upon your former controversy about the articles.” To explain his grace’s meaning, it must be observed, that those canons of the thirty-nine articles of the church of England were received, and declared to be the confession of the faith of the church of Ireland, to which every clergyman was obliged to subscribe. Upon which Dr. Heylin asserted, that the Irish articles of 1615 above mentioned were now repealed. But he recalled this error when he found (the truth) that the Irish articles were still retained and confirmed in these very canons. 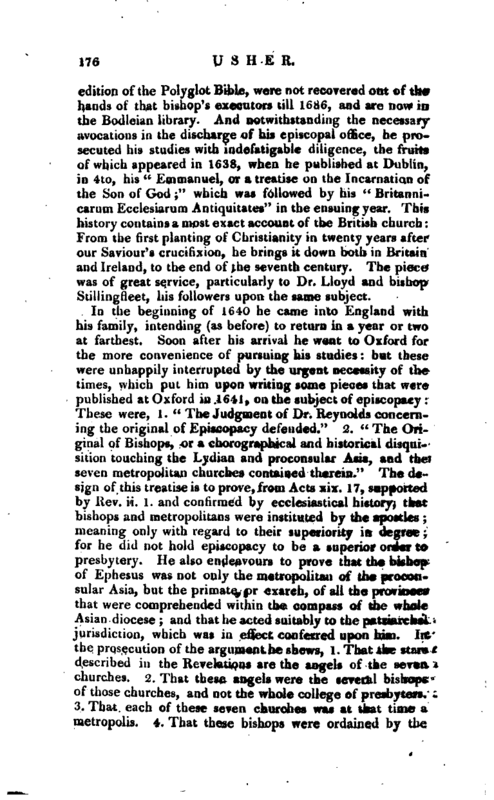 The doctor indeed observed, that the inconsistency of the several articles proved the virtual repeal of the Irish ones: yet it is plain that this was not so understood at that time, nor for several years after, since both the primate and all the rest of the Irish bishops, at all ordinations, took the subscription of the party ordained to both sets of articles, till the Irish rebellion put a stop to all ordinations. However, since the restoratiop of king Charles Ji. a subscription only to. the thirty-nine articles of the church of England is required. All this while he kept a correspondence in every country for the advancement of learning, and procured in 1634 a very good copy of the Samaritan Pentateuch from the East; besides one of the Old Testament in Syriac, and other valuable manuscripts. It was one of the first of those Pentateuchs that ever were brought into these western parts of Europe, as Mr. Selden and Dr. Walton acknowledge; and the Syriac Testament was much more perfect than had hitherto been seen in these parts. The other manuscripts were procured by the means of one Mr. Davies, then a merchant at Aleppo. The archbishop collated the Samaritan with the Hebrew, and marked the differences, after which he intended it for the library of sir Robert Cotton. Bat this, as well as the other manuscripts, being borrowed of him by Dr. Walton, and made use of by hhn in the | edition of the Polyglot Bible, were not recovered out of the hands of that bishop’s executors till 1686, and are novy in the Bodleian library. And notwithstanding the necessaryavocations in the discharge of his episcopal office, he prosecuted his studies with indefatigable diligence, the fruits of which appeared in 1638, when he pablished at Dublin, in 4to, his “Emmanuel, or a treatise on the Incarnation of the Son of God;” which was followed by his “Britannicarum Ecclesiarum Antiquitates” in the ensuing year. This history contains a most exact account of the British church: From the first planting of Christianity in twenty years after our Saviour’s crucifixion, he brings it down both in Britain and Ireland, to the end of the seventh century. The piece was of great service, particularly to Dr. Lloyd and bishop Stillingfleet, his followers upon the same subject. From a ms note in Mr. Gough’s copy of the Biographia Britannica, now in the editor’s possession. The king’s affairs declining, and Oxford being threatened with a siege, he left that city, and retired to Cardiff, in Wales, to the house of sir Timothy Tyrrell, who had married his only daughter, and who was then governor and general of the ordnance. He continued six months here in tranquillity, prosecuting his studies, particularly his “Annals,” and then went to the castle of St. Donate, whither he was invited by the lady dowager Stradling; but in his journey thither fell into the hands of the mountaineers, who took away his books and papers; yet these were, by the kindness of the gentlemen and clergy of that country, in a great measure restored. Before this had been achieved, and while his Mss, the labour of so many years, seemed irrecoverable, he was observed to be more concerned than at all his former sufferings. At St. Donate’s he found an excellent library: but a fit of sickness prevented him from making all the use of it he proposed. His sickness was of an extraordinary nature; it was at first a suppression of urine, with extremity of torture, ending in a violent bleeding at the nose for near forty hours, without any intermission; but when he was every moment expected to die, the bleeding stopped, and he gradually recovered. He went to London in 1646, upon an invitation from the countess of Peterborough to make her house his home and, in 1647, was chosen preacher of Lincoln’s Inn, This society ordered him handsome lodgings, ready furnished, and several rooms for his library, which was about this time brought up from Chester, being almost all the remains of his substance that had escaped the rebels. Mr. | (afterwards lord chief justice) Hale was then a bencher of the society, and probably had the chief hand in procuring him this place; and it happened that the society was well rewarded for it by that treasure lodged in this library by the lord chief justice in four volumes, which were extracted from the primate’s manuscripts; of which Dr. Parr has subjoined to his Life of the primate a catalogue, consisting of thirty-three very curious books. Here the primate constantly preached all term-time for almost eight years, till at last, his eye-sight and teeth beginning to fail him, he could not well be heard in so large a congregation, and was forced to quit this place about a year and a half ‘before his death, to the great regret of the society. In the mean time, amidst all the convulsions of the times, he continued his studies, and the year he was chosen to Lincoln’s Inn, published his treatise “De Romanae Ecclesiae Symbol^,” which he followed by his “Dissertatio de Macedonum et Asianorum anno solari” in the beginning of 1648, 8vo. la this tract, besides fixing the exact time of St. Polycarp’s martyrdom, he compares the Grecian and Macedonian months with the Julian and other nations; and, having laid down the method and disposition of the Macedonian and Asiatic year, he adds rules for finding out the cycles of the sun and moon, and Easter for ever, with several curious accounts of the celestial motions according to the ancient Greek astronomers, Melon, Calippus, Eudoxus, and others. To which is annexed an Ephemeris, or entire Greek and Roman calendar for the whole year, with the rising and setting of the stars in that climate. About this time he was sent for to the Isle of Wight by his majesty, to assist him in treating with the parliament upon the point of episcopacy; when he proposed an expedient, which he called “Presbyterian and Episcopal Government conjoined,” which the king approved as the likeliest means of reconciling the then differences. But no proposals, how moderate soever, were able to satisfy the presbyterians, till his majesty was taken out of their hands by the army, and brought to the scaffold, the sight of which struck our primate with the utmost horror. The countess of Peterborough’s house, where the primate then lived, being exactly opposite to Charing Cross, several of the family, at the time of the king’s execution, went up to the leads of the house, which commanded a full view of Whitehall; and, as soon as his majesty came upon the | scaffold, some of them went down and told the primate, asking him it’ he would not see the king once more before he was put to death. Though unwilling at first, yet he was persuaded at length to go up, as well out of a desire to see the king once again, as from curiosity, since he could scarce believe what they told him. When he came upon the leads his majesty was in his speech. The primate stood still, and said nothing, but sighed; and, lifting his hands and eyes full of tears towards heaven, seemed to pray earnestly. But when the king had done speaking, and had taken off“his cloaths and doublet, and stood stript in his waistcoat, and the executioners in vizards began to put up the king’s hair, he grew pale, and would have fainted if he had not been immediately carried off. He kept the 30th of January as a private fast as long as he lived. In 1650 he published the first part of his” Annals of the Old Testament,“and the second in. 1654. The two parts were printed together, under the title of” Annales Veteris 11 Novi Testament!,“at Paris, 1673, and at Geneva, 1722, in folio. In 1652 he published his” Epistola ad Ludovicum Capellum de variantibus textus Hebraici lectionibu*,*' Lond. 1640. His great reputation having excited in Cromwell a curiosity to see him, the primate, upon the usurper’s intimation of it to him, went, and was received with great civility: Cromwell made him also many promises, but never performed them, and it was on this occasion that the primate predicted the restoration, in a conversation with Dr. Parr, his biographer. “This false man hath broken his word with me, and refuses to perform what he promised. Well, he will have little cause to glory in his wickedness; for he will not continue long. The king will return: Though I shall not live to see it, you may. The government, both in church and state, is in confusion. The papists are advancing their projects, and making such advantages as will hardly be prevented.” The same year, 1654, he published his last piece, 6t De Graeca Septuaginta Interpretum verum Syntagma," &c. and preached Mr. Selden’s funeralsermon in the Temple-church. On March 20, 1655-6, he was taken ill, and died the day following, in the countess of Peterborough’s house at Kyegate in Surrey. Though he was seventy-six, his illness proved to be a pleurisy: for, upon opening his body, a great deal of coagulated blood was found settled in his left side. Preparations were making | to bury him privately; but Cromwell ordered him to be interred with great magnificence in Erasmus’s chapel in Westminster-abbey, the funeral service being performed according to the liturgy of the church of England. This was a great indulgence, but the usurper meant to make himself popular, knowing what a high reputation the deceased had among all orders of men yet was politic enough to throw the expence of the funeral upon his relations, who were ill able to bear it. 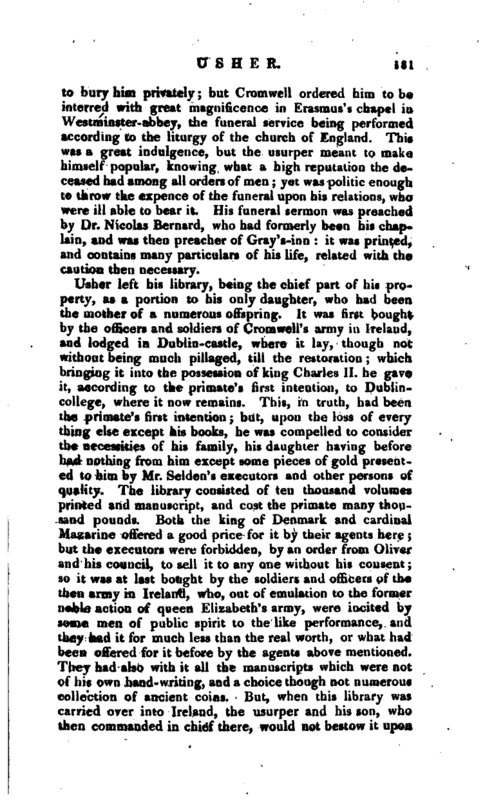 His funeral sermon was preached by Dr. Nicolas Bernard, who had formerly been his chaplain, and was then preacher of Gray’s-inn: it was printed, and contains many particulars of his life, related with the caution then necessary. Usher left his library, being the chief part of his property, as a portion to his only daughter, who had been the mother of a numerous offspring. It was first bought by the officers and soldiers of Cromwell’s army in Ireland, and lodged in Dublin-castle, where it lay, though not without being much pillaged, till the restoration; which bringing it into the possession of king Charles II. he gave it, according to the primate’s first intention, to Dublincollege, where it now remains. 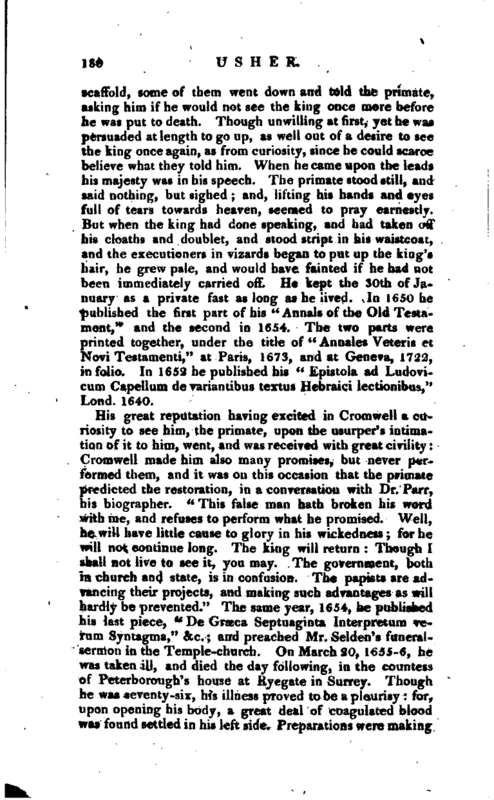 This, in truth, had been the primate’s first intention; but, upon the loss of every thing else except his books, he was compelled to consider the necessities of his family, his daughter having before had nothing from him except some pieces of gold presented to him by Mr. Selden’s executors and other pqrsons of quality. The library consisted of ten thousand volumes printed and manuscript, and cost the primate many thousand pounds. Both the king of Denmark and cardinal Mazarine offered a good price for it by their agents here; but the executors were forbidden, by an order from Oliver and his council, to sell it to any one without his consent; so it was at last bought by the soldiers and officers of the then army in Ireland, who, out of emulation to the former noble action of queen Elizabeth’s army, were incited by some men of public spirit to the like performance, and they had it for much less than the real worth, or what had been offered for it before by the agents above mentioned. They had also with it all the manuscripts which were not of his own hand-writing, and a choice though not numerous collection of ancient coins. But, when this library was carried over into Ireland, the usurper and his son, who then commanded in chief there, would not bestow it upon | the college, lest perhaps the gift should not appear so considerable there as it would do by itself; and therefore they gave out that they intended it for a new college or hall which they said they intended to build and endow. But it proved that, as these were not times, so they were not persons capable of any such noble or pious work; and this library lay in the castle of Dublin till Cromwell’s death; and, during the anarchy and confusion that followed, the rooms where it was kept being left open, many of the books, and most of the best manuscripts, were stolen away, or else embezzled by those that were intrusted with them. Archbishop Usher was tall, well-shaped, and walked upright to the last. His hair was b’rown, his complexion sanguine, his countenance full of good-nature as well as gravity: yet, Dr. Parr says, the air of his face was hard to hit, and that, though many pictures were taken of him, he never saw but one like him, which was done by sir Peter Lely. He was a man who abounded in all graces, moral as well as spiritual; which, joined with the greatest abilities and learning, made him upon the whole a very complete character. Among his Mss. 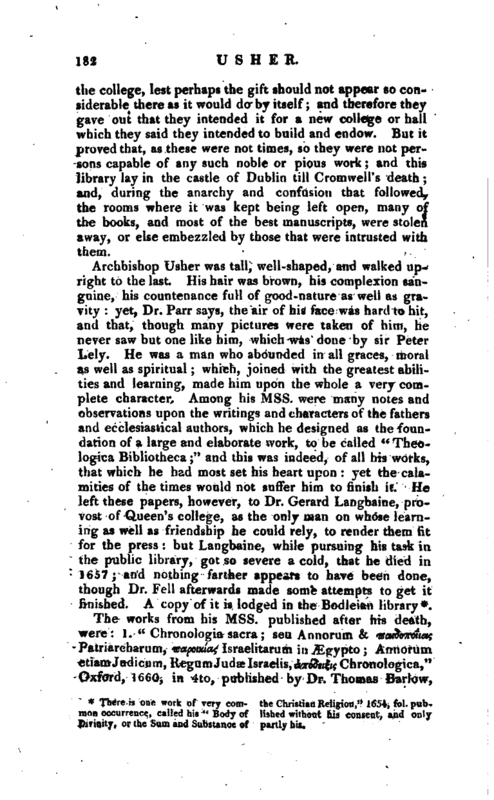 were many notes and observations upon the writings and characters of the fathers and ecclesiastical authors, which he designed as the foundation of a large and elaborate work, to be called “The.ologica Bibliotheca;” and this was indeed, of all his works, that which, he had most set his heart upon: yet the calamities of the times would not suffer him to finish it. 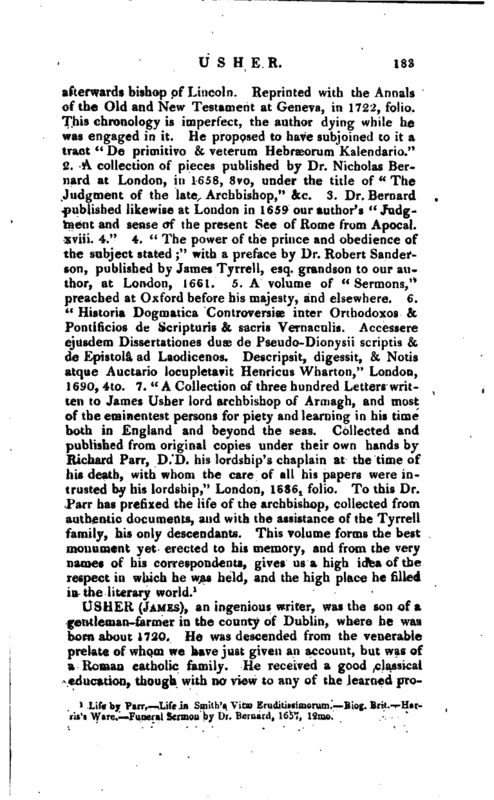 He left these papers, however, to Dr. Gerard Langbaine, proTost of Queen’s college, as the only man on whose learning as well as friendship he could rely, to render them fit for the press: but Langbaine, while pursuing his task in the public library, got so severe a cold, that he died in 1657; and nothing farther appears to have been done, though Dr. Fell afterwards made some attempts to get it finished. A copy of it is lodged ip the Bodleian library*. The works from his Mss. published after his death, were: 1. “Chronologia sacra seu Annorum & wadoncltcts Patriarcharum, isapoMiois Israelitarum in Ægypto Annorum etiamJudicum,RegumJudae Israelis, ^o3fi|<jChronologica,” Oxford, 166Q, in 4to, published by Dr. Thomas Barlow,. Life by Parr. Life in Smith’s Vitas Eruditissiraorum. Biog. Brit. Harris’s Ware. Funeral Sermon by Mr. Bernard, 1657, 12mo.